« NEARfest 2011 – A Wake-Up Call for Prog? Palepoli (The Old Town, currently the gorgeous seafront area called Santa Lucia) is the original nucleus of the city that would later become Naples, one of the most loved and loathed places in the world – the Italian music capital, and a notorious abode of crime and squalor (cue the hard-hitting movie Gomorrah, and the deplorable rubbish débacle of a few years ago, which seems to have reared its ugly head once again). Naples is breathtaking in its splendour, and infuriating in its unbridled anarchy – perhaps not the best place to live for those who like quiet and order, but also one to experience at least once in a lifetime (for the glorious food as well as for the scenery, the art and the music). The old adage “See Naples and then die” is indeed quite true. A walk in the so-called Spanish quarters is the closest you can get to a Middle Eastern souk in the heart of western Europe – and probably no one has managed to capture that heady atmosphere better than the third album released by Naples’ own Osanna. One of the most distinctive bands of the original RPI scene, Osanna were hot stuff back in the Seventies. With their painted faces (harking back to the city’s traditional mask of Pulcinella) and wild, energetic sound, they blended British-style heavy rock with influences coming from the venerable musical tradition of their hometown. It has even been intimated that Peter Gabriel took his cue from Osanna for his stage make-up when the two bands toured Italy together. Like so many of their fellow Neapolitans, the five members of the band had music in their blood – not the tasteful, restrained kind practiced by northern Italians PFM, though, but rather a full-throttle blend of passion, energy and chops. 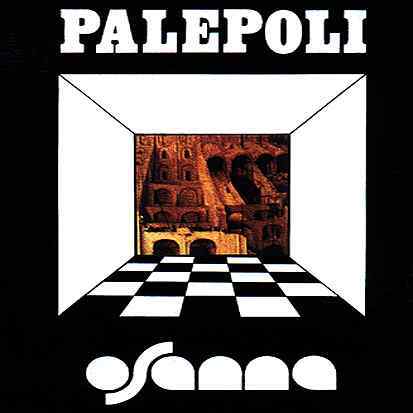 Much in the same way as ELP’s output, Palepoli is not for those in search of subtlety, though I would not call it self-indulgent either. The chaos on display on the album is of the controlled variety, in spite of the somewhat fragmented nature of the compositions. However, those fragments, like the pieces of a puzzle, eventually fall together to form a complete picture. The two main tracks, sprawling epics that approach or even exceed 20 minutes in length, are linked by a short piece reprising the opening of the album itself, and give an entirely new meaning to the expression ‘rollercoaster ride’. It is no wonder that Palepoli commands such adoration on the part of prog fans. Indeed, it shows progressive rock at its authentic best, soothing and lyrical at times, and at others raw, aggressive and passionate. It also offers further proof of the invaluable contribution brought by local musical traditions to the progressive melting pot. Unlike Banco del Mutuo Soccorso and their fellow Neapolitans Balletto di Bronzo, Osanna’s sound is driven by Danilo Rustici’s slashing guitar and Elio D’Anna’s sax and flute – which add a mixture of lyricism and aggression to the already exciting texture of the music – rather than by keyboards. However, it is Lino Vairetti’s stellar vocal performance that lends the album a unique appeal. Heir to one of the greatest singing traditions in the Western world, Vairetti fully deserves pride of place among the great prog singers: in my view, his clear, versatile voice is probably second only to Banco’s Francesco Di Giacomo on the Italian prog scene. The intro to the first track, “Oro Caldo”, a colourful, richly-textured patchwork of musical moods, suggests the atmosphere of Naples’ narrow alleys and street markets, dirty, noisy, and thoroughly fascinating, a babel of sounds, voices and sights. The influence of Neapolitan folk music, such as the frantic rhythms of the tarantella, is evident throughout the piece, especially when, at the beginning, the band members sing in Neapolitan – probably one of the best vehicles for song and music known to man, and a language with a rich literary tradition in its own right. “Oro Caldo” rocks hard, but also offers quieter, more meditative moments – just like escaping the chaotic atmosphere of the Naples alleys into a darkened, half-deserted church. The second epic, “Animale Senza Respiro”, is a somewhat more structured piece, though it does adopt the same eclectic approach as “Oro Caldo”. It is also a distinctly darker offering, with some angular, jazzy stylings bordering on the avant-garde, dominated by flutes and saxes, interspersed with almost unexpected acoustic breaks. Though it is definitely not as easy on the ear as PFM’s stately, melodic compositions, it is nonetheless a captivating number with a strong emotional impact. If you want soothing, pastoral beauty, or music that does not demand too much engagement from the listener, give this one a miss. Like the city of Naples itself, Palepoli is not for the squeamish. However, if you like your prog with some bite (and here there is plenty – think lashings of red hot pepper), and do not mind hearing people sing in a language other than English, this will grab you like few other discs produced in the Seventies. A concept album that is rooted in gritty reality and not in the airy-fairy, supported by first-class musicianship and singing, Palepoli has acquired near-legendary status among prog fans, and deservedly so. After an almost 20-year hiatus, Osanna reformed in the early 2000s (though only Lino Vairetti remains of the original line-up), and recently joined forces with former Van Der Graaf Generator’s saxophonist David Jackson. Their 2009 album, Prog Family, is an excellent compendium of the band’s whole output, with new arrangements of their classics and the contribution of such distinguished guests as singer Sophya Baccini (also a native of Naples), Balletto di Bronzo keyboardist Gianni Leone, and former King Crimson violinist David Cross. Below this post you will find a link to an interview with Lino Vairetti which I translated for the ProgSphere website, shedding some light on the band’s past and recent history. In the light of the events of the past weekend (amply discussed in my previous blog post), the interviewer’s mention of NEARfest feels particularly poignant. In my view, Osanna would have made a wonderful headliner for the festival, but were not even considered… Food for thought? Great review, Raffaella. You truly have a way with words … few reviews have the ability to capture the imagination like your’s and even fewer manage to describe the indescribable so eloquently. Congratulations. Thank you so much, Ian! Your kind words mean a lot to me. So happy you liked the album!